As a mother, I feel that it is my responsibility to support others whose children have fallen victim to police violence, and to be a voice for my son Sean Bell. It’s hard for me to celebrate on Mother’s Day. I feel the absence of my son Sean Elijah Bell, who was killed on November 25, 2006—his wedding day—in a hail of 50 bullets fired by New York City police officers. He was only 23. My son and two of his friends were leaving Club Kalua in Jamaica, Queens, where he had been celebrating his bachelor party. Three undercover detectives were in the club. The NYPD had formed a new Club Enforcement Initiative, transferring detectives from vice and narcotics to crack down on nightspots; the officers said they were at Club Kalua because the club was under surveillance for drugs and prostitution. One of the officers, Detective Gescard Isnora, later testified that he saw someone arguing with my son and his friends and that he thought there was a gun involved. While in communication with his commanding officer, Lieutenant Gary Napoli, Isnora followed my son and his friends as they walked to my son’s car. The lieutenant gave the order for backup to move in. Two unmarked vehicles with cops inside pulled up and boxed my son’s car in. Detective Isnora had his weapon drawn. Sean’s friends later testified that they had no idea they were facing cops. Why the shooting started is still unclear, but what is clear is that Detective Isnora shot first, ultimately firing eleven times. Four other cops fired after Isnora; Detective Michael Oliver emptied his gun twice, firing a total of thirty-one times. He even stopped to reload. It was his bullet that killed my son. My son was hit four times, with bullets passing through his right shoulder, arm, lung, liver, and larynx. He was pronounced dead at Jamaica Hospital at 4:56 am. That was eight years ago—but not much has changed since then. Seemingly every week another unarmed black man or woman is in the news, having been killed by a police officer or vigilante who made another fatally false assumption. Trayvon Martin, Eric Garner, Michael Brown, Tamir Rice, Walter Scott, Rekia Boyd, Freddie Gray––the list goes on. These were all sons and daughters to someone. Our husbands will not come to us, reeking with carnage, for caresses and applause. Our sons shall not be taken from us to unlearn all that we have been able to teach them of charity, mercy and patience.… From the bosom of the devastated earth a voice goes up with our own. It says: Disarm, disarm! It’s now a century after the founding of Mother’s Day, and our sons are still being taken from us. Society has not disarmed, but militarized to the teeth. Mothers’ sons everywhere are still killing and being killed. We have had enough. Police militarization has ripped apart the fabric of our communities. Armed with military grade vehicles and weapons, warrior cops cultivate an atmosphere of tension and fear, exacerbating conflicts instead of resolving them. We all know we’re going to die one day, but it certainly should not be at the hands of a public servant who is supposed to serve and protect us. 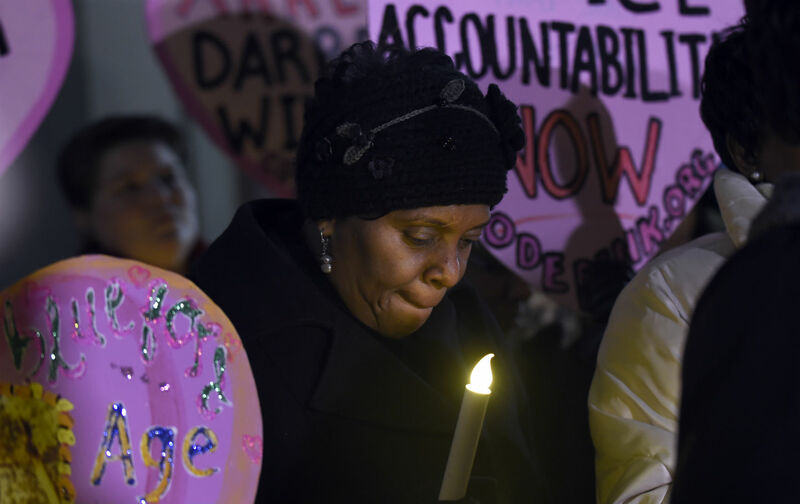 Last December, I joined a delegation of grieving mothers organized by CODEPINK, and we brought our stories to Congress, the White House, and the Department of Justice. We made demands for police accountability: fair punishment for officers who fail to follow implemented protocol of the department leading to the death of civilians. We also made a demand for special prosecutors to be brought into these cases. Did our cries fall upon deaf ears? When will things change? As a mother, I feel that it is my responsibility to help others–– to support other mothers whose children have also fallen victim to police violence, to be a voice for my son, Sean Bell. Valerie BellValerie M. Bell is the mother of Sean Bell, the unarmed 23-year-old man who was killed in a fusillade of 50 shots by New York City police officers on his wedding day, in the early morning hours of November 25, 2006. Over the last eight years, Mrs. Bell has fought for justice for her son.